Synopsis: A teenager gets a summer job working for a horse trainer and befriends the fading racehorse, Lean on Pete. A24 has emerged as one of the freshest production and distribution companies in today’s Hollywood. The end of last year alone saw the release of brilliant movies like Lady Bird, The Disaster Artist, The Killing of a Sacred Deer, and The Florida Project. And the studio is showing no signs of letting up with their first big release of 2018, the boy-and-his-horse drama Lean on Pete. Lean on Pete is about a boy named Charley Thompson (All the Money in the World‘s Charlie Plummer) who lives in poverty with his father, Ray (Travis Fimmel from Maggie’s Plan and “Vikings”), in Portland, Oregon. 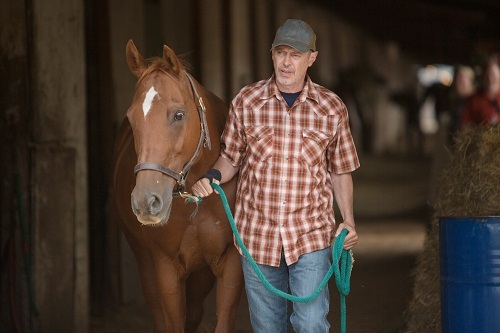 Charley’s emotional escape arrives when he gets a job taking care of a racehorse named Lean on Pete at the local racetrack. At first, Charley finds comfort and camaraderie with Pete’s owner, Del Montgomery (The Death of Stalin‘s Steve Buscemi), and his jockey, Bonnie (Chloë Sevigny from Love & Friendship and The Snowman). However, when Charley learns that the aging Quarter Horse has outlived his usefulness to Del and is headed for the glue factory, Charley steals him and the pair heads off to have all of the adventures that a boy and a horse can have. That synopsis makes Lean on Pete sound like a feel-good Disney movie, and it is anything but. Written and directed by Andrew Haigh (45 Years, Weekend) and based on the beloved novel by Willy Vlautin (The Motel Life), Lean on Pete is more Wendy and Lucy than Black Beauty. The coming-of-age story hits all the right notes on its roller coaster ride, going from hopefully uplifting to brutally depressing, sometimes all within the same scene. It touches on darkness at times, and even has a bit of shock value to it. It’s a well-made and engaging movie, but there’s little chance anyone will want to see it twice. It’s that devastating. The horse from which Lean on Pete gets its name is at the center of the film, even if Charley is the main protagonist. The narrative is almost episodic in nature, with Charley and Pete roaming through different stories and becoming involved with a myriad of characters as they go on the lam. Pete winds up being a sounding board for Charley, keeping the audience involved during the long stretches of the film in which it’s all just the boy and the horse. For a silent role, Pete carries the film, morphing into the strength and support that Charley so desperately needs in his life. Lean on Pete is an incredibly well-crafted movie, but it’s also powerfully disturbing and heartbreakingly depressing, so be careful with it. It’s kind of like a cinematic kindred spirit to Wiener-Dog, the Todd Solondz movie from a couple of years ago about a dog that travels from owner to owner and gets into different kinds of trouble with each one. Charley and Pete go through terrible ordeals to get to where they’re going, just like the little dachshund does, and in the end, the audience feels intense sympathy for all involved: dog, horse, and boy. 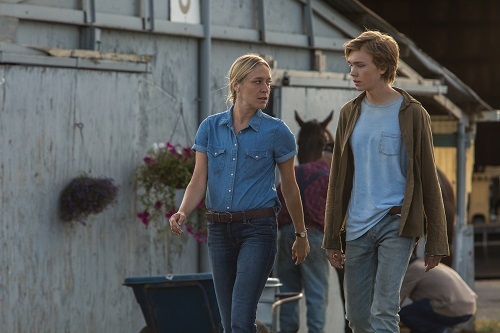 However, Lean on Pete does not treat its subjects with even an ounce of humor, making the tragic parts of it even more tragic. It’s a tough watch, but Lean on Pete is worth it. At least, it’s worth it once. There is beauty in the emotional carnage that is Lean on Pete, and it lies within the cinematography. The film was shot by director of photography Magnus Nordenhof Jønck (A War), who captures the action with lots of long, conversational takes that give the talented cast plenty of room to work. This lets the actors play out the scenes as organically and naturally as possible, which in turn leads to some truly unforgettable moments. The external scenes, most of which were shot in and around the Portland area, are cinematic magic, with Jønck letting the camera soak up the locations with wide and long shots that are not unlike those found in classic westerns. Much of the movie is laced with camera motion as well, so the audience feels as if they are on the journey with Charley and Pete. The cinematography all seems so simple, but it’s a big part of what makes Lean on Pete such a powerful movie.